S.E. Cupp believes that a revolution is happening all around us in America--a revolution that is being waged against the vast majority of Americans by a very small group of liberal "elites." It is a bloodless, quiet, smarmy sort of revolution where faith, God, religion and especially Christianity are systematically being targeted for removal from the public sphere. 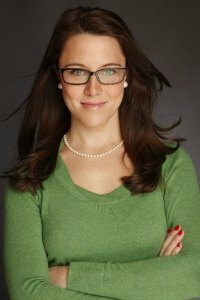 In her newest book Losing Our Religion: the Liberal Media's Attack on Christianity, Cupp makes a strong case against the liberal "mainstream" media and what she believes is it's quest to secularize America. Cupp is a fixture on the cable news circuit, appearing on MSNBC, CNN, C-SPAN and the Fox News Channel. she is a nationally published political columnist, and an online columnist for the New York Daily News. So why would an atheist write a book in defense of religion? Well, perhaps Mike Huckabee, former of governor of Arkansas, presidential candidate and talk show host might shed some light on things. After all, he wrote the foreword to the book. In his estimation, S.E. 's thoughts on religion in America and the way the liberal press seems to be so bent on eradicating it "makes for commonsense conservatism" that "will irritate the daylights out of the lite establishment." I'm pretty sure that she will do just that with Losing Our Religion. Cupp systematically moves through the major bones of contention that seem to exist between Christians and secular society: Evolution, Gay Marriage, Hollywood, Abortion and Sexual Immorality. She takes on the double standards that seem to exist in the liberal media when politicians fall from grace. She also takes up the mantle of conservative media outlets that are often criticized for the bias, asserting that liberals overlook the same sort of bias in outlets that cry objectivity. She also takes some serious shots at President Obama, and characterizes him as a non-religious, opportunistic, Christian-in-name-only sort of fellow. Cupp's point to all this is this: 80% of Americans still declare themselves to be "Christian" (although I would argue that most of them hardly know what that really means), and it is astounding that the majority seems to be standing idly by while talking heads on TV, faceless columnists from the New York Times, and many others smugly seem to attack what should be at the very core of their being. I would argue that a very small, vocal minority of Christians are fighting back, and they are giving as much vitriol and aggression as they are getting. Cupp doesn't offer any quotes from Glenn Beck, Sean Hannity, Bill O'Reilly and the like. If she did, her readers would see clearly that the vitriol is just bad from the Right. And maybe it's because Cupp is an atheist that she doesn't fully grasp the true message of Christ, but I am not sure that Jesus would have dug the whole "vitriol" and "aggression" approach. And honestly, I am not afraid of Christianity coming under fire. The Church of Jesus Christ tends to thrive when it's persecuted. Besides, we need a little de-Constantinization of the Church anyway. We've gotten complacent, fat and happy. Maybe, instead of fighting back when we are criticized, we should ask for forgiveness and begin the humble task of just being the hands and feet of Christ. What I will agree with Cupp on is the way that the dialogue in our country seems to have devolved into nothing more than horrid insults, condescending speech, pandering to bias, and many other wonderful things that undermine collegiality and respect. It was a good thing that Keith Olberman got fired. It should have happened sooner. Maybe if the cable networks took MSNBC's lead, some of these hateful hosts on both sides of the political spectrum would tone down their rhetoric. An interesting read. While I can agree with most of it, there are a few things I just can't find myself being in complete concurrence with. I fail to see how it was a good thing that Keith Olbermann got fired. Keith Olbermann, in comparison to the far right stated facts, and behaved very respectfully to the Republicans he had on his show. I can't understand how one can consider Keith Olbermann to be, in any way hateful. I could understand saying that Glenn Beck, Limbaugh, Hannity, O'Reilly; etc, who have all purposefully distorted facts, or completely changed them just to mislead, and gain a following of hyper-angry misinformed viewers. Rachel Maddow, Chris Matthews, Keith Olbermann, Ed Schultz-- these individuals do not feed off of the anger from one group of misinformed people. It's been interesting for the last two-to-four-years. Those on the left, and right trying to accomplish good things, trying to spread the truth have been called socialists, or liberals; or just lambasted completely for trying to do what they can to help fellow Americans. No other example of this is greater than Alan Grayson and not Obamacare, but The Patient Protection and Affordable Care Act, the correct name of the legislation. The left stood up, trying to do what was not only morally, and ethically right to help fellow Americans by giving them fair and equitable health care that they couldn't get before hand. When the left stood up to fight for the life, in this case the true definition of pro-life; the right only hit them with a cat o' nine tails claiming that they were socialist, and trying to destroy America. Luckily, there were people with the ability, and gall to speak up: Congressman Alan Grayson, Congressman Anthony Weiner, Speaker of the House Pelosi. The left was forced into using flashy rhetoric to transfer into thirty second soundbites to get any attention, because the right completely misusing facts, abusing the truth; and just outright lying. To vilify the left by completely equating it to the right is unfair. Has both done wrong? Oh, indeed they have, but the simple fact(s) of the matter is very much to the contrary. Without people like Keith Olbermann; we wouldn't have had the ability to pass health reform, the ability to challenge the Iraq war as much as we did, the ability to come out of the closet as liberals. The right has their talk shows, and the left has theirs. While both tend to distort facts, the left has, for the last two years, done it less. Your comments sort of prove her point, to be honest. I try to be as objective as I can about the talking heads. If they act like idiots, are condescending, obnoxious, hate-filled and contribute to the general lack of rancor in our public discourse, I hope they get canned. I don't care which side of the political spectrum they are on. Giving a free pass to Olberman and the like is not an act of objectivity.